Hedna Salmeron arrived from South Africa on American soil in 1990 with two suitcases, less than $600 in her pocket, a fine bottle of 1966 Portuguese Port, a work visa, and the American Dream. 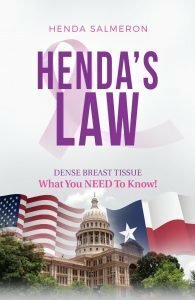 Since, Henda has become a United States citizen, a mother, an Award Winning Real-Estate Broker, an accomplished investor, serial entrepreneur, a published author, an ultra endurance race global competitor, a breast cancer survivor who served on the Board of Susan G. Komen – Dallas, and an accidental power lobbyist who passed one of the most important and influential healthcare bills in the nation in 2011, known as Henda’s Law Texas HB-2102. CLICK HERE to register your support for the Henda’s Law Re-Awareness Campaign and receive valuable information, private offers, and sponsor gifts!